Event organizers are always on the lookout for innovative session formats and tips to make their events an unforgettable experience. 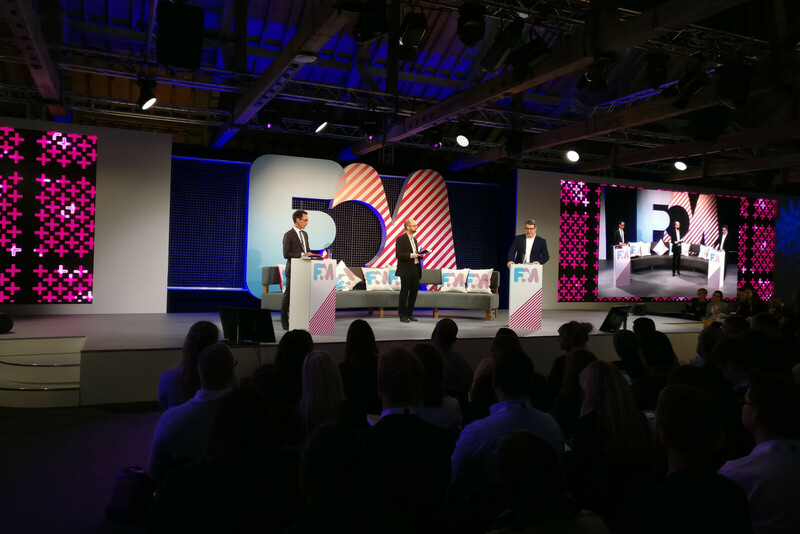 The organizers of this year’s Festival of Marketing in London hit the nail on the head when they wrapped up the two-day event with a tech-powered expert debate between Mark Ritson and Professor Byron Sharp. This closing headline session was an excellent alternative to a traditional keynote format. The entertaining stand-off between the two marketing titans kept the participants on the edge of their seats until the very end. Here is a short summary of how they pulled it off. The debate brought together two of the world’s leading voices in marketing. They entered the imaginary boxing ring to exchange their ideas on the industry’s future. On one side was Byron Sharp, Professor of Marketing Science, Director of the Ehrenberg-Bass Institute and the author of How Brands Grow. Opposite him stood his challenger, Mark Ritson, academic, brand consultant and award-winning Marketing Week columnist. Like a proper boxing match, this interactive 45-minute session was facilitated by an expert moderator who introduced both speakers ‘into the ring’ and kept the discussion on track. The conversational format of this session was a particularly engaging way to deliver content to the audience. Each speaker was assigned 10 minutes to present his arguments, followed by a discussion. To kick off the debate, the moderator introduced the speakers. As part of the introduction, the moderator encouraged the audience to get involved in the debate and submit questions and vote for their favorite ones through Slido. Then, the actual debate got underway. Mark Ritson started off by presenting his critique of Byron Sharp’s book and its author’s scientific views on marketing. In response, Byron Sharp was given the chance to react and refute Mark Ritson’s arguments in his 10-minute slot that followed. Meanwhile, the attendees were submitting their own questions for the speakers and voting for those they wanted answered the most. During the Q&A that followed, both speakers were given the chance to respond to the live audience questions displayed on a screen. The speakers could react to each other’s arguments in a 15-minute time slot. It was very entertaining to watch the polarizing expert debate between the two speakers with such contrasting views. The tension that arose from the exchange of opposing arguments kept the audience engaged throughout. In total, the audience submitted nearly 50 questions to be answered during the session and placed 323 ‘likes’ on questions. To conclude the Q&A, the facilitator encouraged the participants in the room to join the conversation live and express their opinion. Consequently, one brave soul stood up in front of a few hundred people in the audience. The person made a point in disagreement with one of the speakers. This was followed by grand applause in support from the rest of the audience. Finally, it was time to wrap up the session. 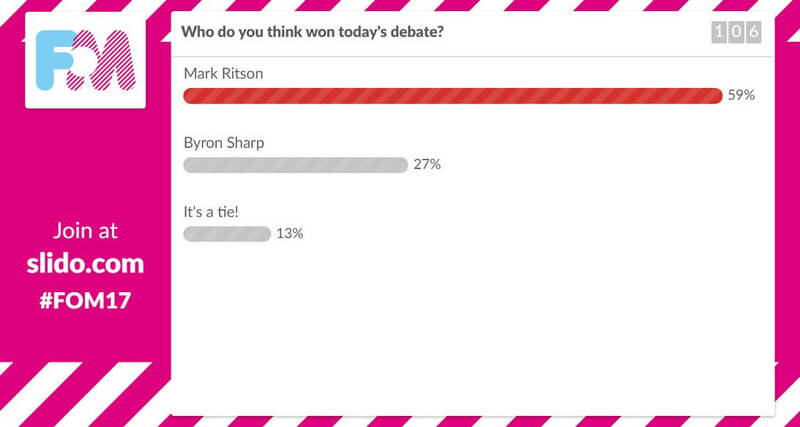 In the poll, 59% of the audience crowned Mark Ritson the winner of the debate! 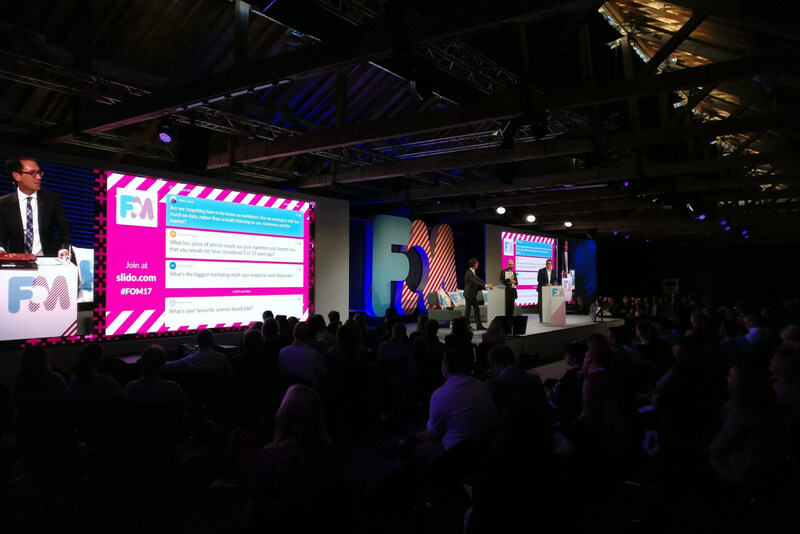 The expert debate proved to be a great interactive alternative to a standard-format keynote session. The audience remained engaged throughout the session thanks to the excitement and tension produced by the opposing arguments. Using Slido empowered the audience to become a part of the conversation. And finally, the audience’s ability to appoint a winner kept the participants on the edge of their seats until the very end.